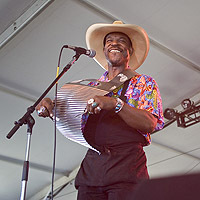 The Zydeco Flames have gained a reputation as the West Coast's premiere Zydeco band. The Flames consistently pack the house in venues ranging from contemporary clubs to major festivals and traditional dancehalls. Their sizzling roots rhythms are timeless and the execution of them relentless, with a stunningly powerful groove. The Flames' sixth CD release "Fire It Up", provides fans with hot Zydeco in the tradition of masters like Clifton Chenier, Buckwheat Zydeco and Queen Ida. Oakland City Center Sounds (2007), featuring "Fire It Up"
Five Flames songs are featured in the computer reality game, "The Sims Unleashed"
(vocals, rubboard, harmonica, lyrics) Lloyd is a consummate entertainer and rousing crowd pleaser. His infectious energy infuses audiences wherever he performs. 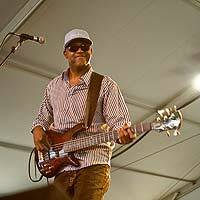 A classically trained singer, Lloyd's soulful, steamy style ranges from rock to blues to R&B, leading to a unique blend of Zydeco. His diverse musical background includes performances and recordings with Mal Sharpe's Big Money, Tom Rigney, Motordude Zydeco and Elvin Bishop. 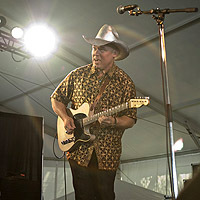 He appears regularly with bandmate and guitarist, Freeway Frank, at the notorious Twangfest. (guitar) Frank has musical roots deep in the styles of the Chicago blues. Flames' fans are energized by his masterful solos and rhythm guitar work. Frank also served as bandleader for Freeway Frank and the Hotwires, and has played with Johnny Copeland, Alvin "Youngblood" Hart, Ricardo Scales, and Johnny Nitro. You can find Frank on Saturday mornings hamming it up with Marin favorites in the "Frank and Ted Show" at the Coffee Roasters in San Anselmo and jamming every other Wednesday at the infamous "Twangfest" at Peri's in Fairfax with local luminaries Bonnie Hayes, Ted O'Connell, Jeb Harrison, Tal Morris, Eric Shram and Kevin Hayes (of the Robert Cray Band). (accordion) Bruce has traveled extensively in southwest Louisiana,playing with some of the best cajun and creole musicians. He has recorded for film, radio and TV. He worked with Roy Rogers on a grammy nominated album for Ramblin' Jack Eliott, as well as performing with the likes of: Norton Buffalo, Jackie Payne, Luther Tucker, Elvin Bishop, Sista Monica, Kenny Neal and The California Honeydrops. (bass, vocals, lyrics, producer, engineer) Timm is one reason why The Flames are known for having one of the tightest rhythm sections in the business. 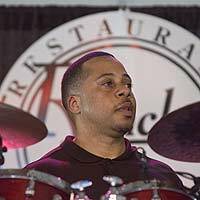 His performance credits include work with The Larry James Band, Roy Gaines, J.J. Malone, Sista Monica, Bobby Murray, and Andre Thierry. He is also a core member of The Elvin Bishop Band. Timm produced and engineered the Flames’ most recent CDs, "Bank the Fire” and “Fire it Up;" founded and recorded the New Orleans flavored funk at Beaufunk and engineered and produced their first CD "Change Gone Come Fa Betta." (drums) William's inspirational playing, with his unique brand of Louisiana-spiced rhythms, continues to draw fans to their feet and on to the dance floor. This multi-faceted player has deep roots in gospel music, hip-hop, funk and R&B.